There are a lot of choices—from configurations to temperatures, aesthetics to door types—when specifying these hardworking beverage chillers. Here at The Albert in Chicago, bartenders count on multiple Perlick Back Bar Refrigerators—a two-door BBS60 (left) and a three-door BBS84 (right). While bartenders dazzle guests with colorful cocktails and showy preparations, behind the bar are often overlooked workhorses quietly contributing to the operation’s success. 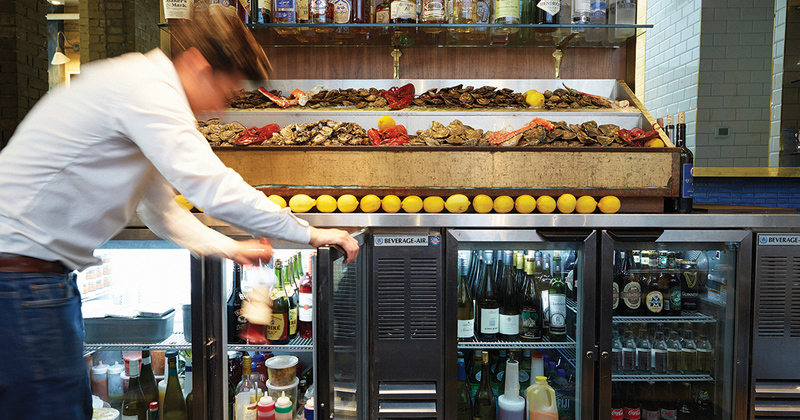 As their compressors purr night and day, these back bar coolers efficiently keep wine, beer and other items chilled at their optimum temperatures, while providing enough storage for service to run smoothly. And they often have to look good doing it, as some models also function as a way to merchandise bar product, adding to a bar’s overall ambiance. 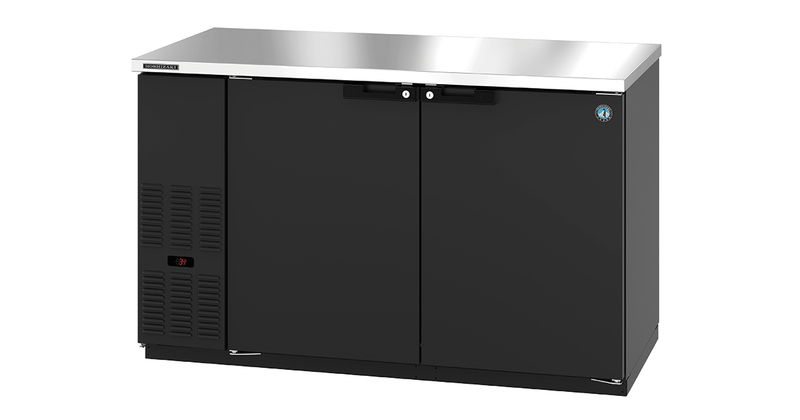 When choosing a back bar cooler, first think about the quantity and diversity of beverages you want to store, and then weigh the available configurations and temperature options. If you’ll be serving draft beverages, instead of specifying a separate keg cooler, you can incorporate it into your back bar cooler. For example, a manufacturer could configure a four-door cooler so that the keg sits behind two of the doors and shelf storage resides behind the other two. Next consider how racks and doors maximize storage and access to drinks. Some back bar coolers come built with door openings large enough to accommodate two vertical rows for wine bottles whereas others offer special wine rack options in which bottles can be stored horizontally. (One maker points out, however, that wine in a commercial setting doesn’t have to be stored on its side to keep its cork moist because it will likely be used before any storage issues arise.) You also can find back bar coolers with storage drawers or rotary shelves to give users easier access to a variety of wine and beer bottles. 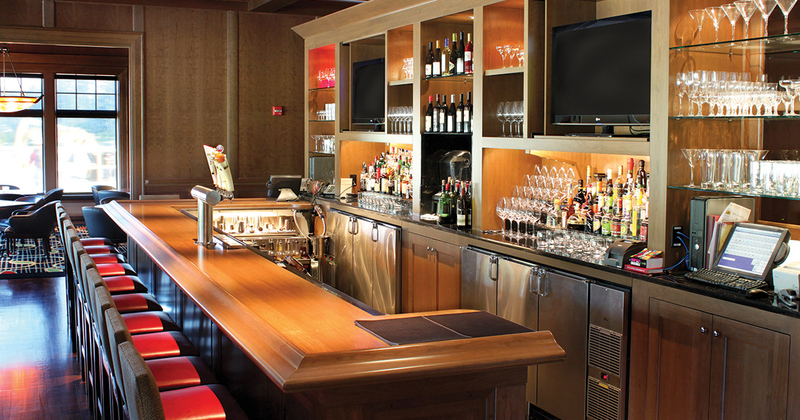 Back bar coolers can store other items such as milk and cream, along with food ingredients for beverage garnishes, including olives, onions, pickles and more. Certain higher-end models earn NSF certification as food-grade units. These units typically come with an interior that’s all stainless with rounded corners for easy cleaning, have been tested to maintain proper air temperature (below 40°F) and have no unnecessary exposed screws and cracks. Operations that store food items might prefer a cooler with solid doors to hide the hodgepodge collection. But glass doors make it easier to locate ingredients. The space between the back and front bar can be fairly tight and so, typically, manufacturers design back bar coolers with somewhat shallow depths to conserve space. To keep flush in line with other under-bar equipment, coolers can be as shallow as 24-in.D but can go up to nearly 30-in.D. Back bar cooler height may measure about 36 in. as manufacturers design them to slide under an existing bar or built-in cabinets. Some lower profile units can be as short as 30 in. with the option to add 6 in. with legs or casters. The most variation comes in the width of back bar cooler models, so choose the unit that best maximizes storage for your needs. Units come in one, two, three or four-door options that range from 24 in. to 108 in. in width. Some back bar coolers will have multiple zones to chill one section for beer and another for red wine, for example. 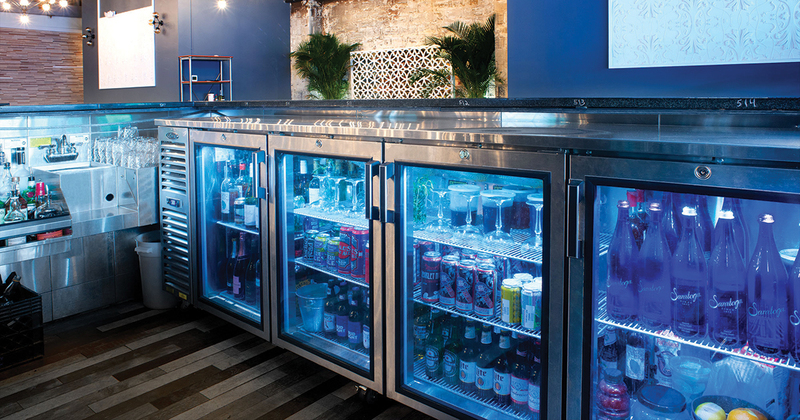 In addition to factoring in what types of products you’ll be storing and your available space, make sure that your back bar cooler has the right design for your business in terms of function and aesthetics. Some manufacturers offer a pass-thru style that can be accessed from both sides. Designers often specify this style in island bars or in layouts where the cooler is stocked from the back and served from the front. To match your bar’s flow and the location of outlets, pay attention to whether the unit’s compressor is on the right or left side. Select manufacturers allow customers to choose either a right- or left-side compressor. This is particularly important when you’ll be using more than one back bar cooler in your lineup. These units shouldn’t have their compressors directly next to each other because it could impact the longevity of the equipment and may even void its warranty. Because many back bar coolers back up to walls or sandwich between cabinets and other equipment, these units tend to have front vents, or if they’re on casters, they could vent from the bottom. Make sure the vents are accessible. And if the unit vents from the bottom, note that the interior space may make it a challenge to store a full-height keg, three rows of beer bottles or two rows of vertically stored wine bottles. Also think about where a service agent will perform repairs. Typically, small back bar coolers are either rear or side-serviced. 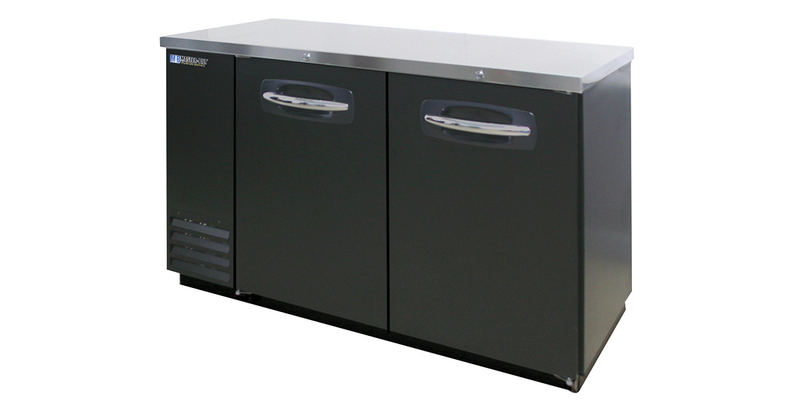 Front-serviced units are available and are a good option for bars in which the back bar cooler is built in and difficult to pull out. Some manufacturers build units so that their doors can be switched to open on either the right or left side to maximize efficiency within the bar layout and flow. Specifiers also can choose between glass doors to show off well-organized stock or solid doors. And some manufacturers allow you to mix and match door styles on the same unit while others stick with one type of door. Doors can be either hinged or sliding. Back bar cooler doors, particularly those that are glass, can show condensation if they are used outside or if enough humid air is inside. To combat this, some back bar coolers come outfitted with heating elements called mullion heaters that fit within the face of the refrigerator’s frame to prevent condensation from forming on the exterior of the unit. Ideally, doors should have handles with built-in locks for loss prevention and a design that minimizes catching clothing or apron strings as employees brush by them in tight quarters. Check to see how easy it would be to replace the door handle if it breaks. Some manufacturers build handles that attach to the doors while others recess them into the face of the door. While many back bar coolers come in black or stainless finishes, there are units that come unlaminated, ready for a custom finish to match the rest of the bar. Likewise, many units come with a standard stainless top but if you are going to put the back bar unit under a cabinet or countertop, you may be able to save some cost by choosing an unfinished top. Like any refrigeration equipment, back bar coolers can be expensive to run, so take note of any area to optimize energy efficiency. For example, while deciding between glass or solid doors might seem like an aesthetic choice, note that glass doors are less energy efficient, meaning that the unit will have to work harder to maintain proper temperatures. Also related to saving energy, many units come standard with energy-efficient LED lighting. The lights illuminate stock when users open doors and shows off product when they’re closed. Study all options when building a back bar cooler; when you make the right choice, it will prove to be a hardworker behind the bar for years to come. One Big Unit Or Two Small Units? Confronted with all the many configurations of back bar coolers, users might be left wondering if it makes more sense to specify a pair of two-door units instead of one four-door unit. Opinions vary. Some manufacturers argue to go with two-door units instead of a four-door unit to decrease the number of times the same cooler will be opened, allowing the unit to better maintain temperatures. They also point out that having multiple units instead of one large cooler means that operations will have at least one working back bar cooler if the other is out of service. Other manufacturers say that specifying redundant equipment in case one breaks down doesn’t make sense (financially and space-wise) for a business and that larger back bar coolers come outfitted with right-sized refrigeration units that make them just as efficient at maintaining temperature. Click here to see our Equipment Comparison Photo Gallery.